Recently I was given the opportunity to try out some lovely things from Uncommon Goods. They have a truly unique selection of items and I was thrilled to get this chance. First of all, I'd like to tell you a bit about Uncommon Goods. Founded in 1999 and headquartered in Brooklyn, New York, Uncommon Goods is a privately-owned retailer that endeavors to feature unique designs and handcrafted gifts created in harmony with the environment and without harm to animals or people. As an independently-owned business, they have the freedom to support causes they believe in and positively impact the world. With every purchase, Uncommon Goods is proud to donate $1 to your choice of their not-for-profit partner organizations. Since they started their Better to Give program 15 years ago, they have donated over $1,000,000 dollars to charities around the world! Their commitment to helping others is truly wonderful. 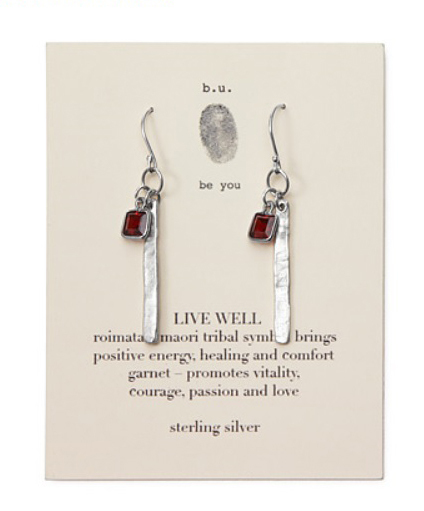 The items that I chose are the Flavor Infuser Water Bottle, the Ticket Stub Diary, and the Live Well Earrings. It was great to sample items of different types as it has given me a varied view of the many things that they have to offer. It's wedding season and I must say that Uncommon Goods is a great place to find some wonderful gifts for weddings or any occasion. 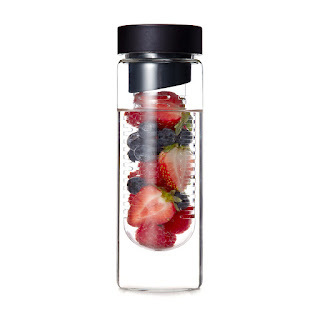 The Flavor Infuser Water Bottle is really great. I'm always trying to get my water intake up each day and this handy bottle has been helpful for me. It has made drinking water a bit more interesting because I'm able to add my favorite fruits to my drink. It's a refreshing treat. The bottle is a great size and has a 16 oz. capacity. It's great to carry around. The Ticket Stub Diary is really cool. I love to go to concerts and different events. For years I've just been shoving my various ticket stubs onto what I call the "important shelf". It's nothing grand...just an open space on my bookshelf that I'm always meaning to organize. Well now I have! Thanks to my new ticket stub diary, I can slide my various memories into the sleeves and preserve them forever. The diary has clear sleeves that fit a variety of ticket sizes and there is space in the margin to write down memories. The pages are acid-free so your tickets will be preserved for a long time. 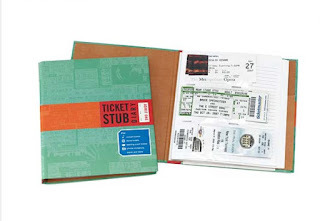 The Ticket Stub Diary is great if you're like me and finally ready to get more organized. Uncommon Goods has something for basically everyone and if you want to add a personal touch they have personalized gifts like the ones found here. And lastly, I got the Live Well Earrings which are just beautiful. These lovely earrings are designed by artist Mary Steratore. First of all, I love the name because it makes me think about having a zest for life and living fully. I was also drawn to them because the garnet is my birthstone. These pretty earrings have a dangling, sterling silver bar that is a Maori symbol called a roimata, which means "teardrop". However, it's used to represent comfort, healing, and strength. The sterling silver bar is set off by a pendant of square-cut garnet. As I mentioned, my birthstone is the garnet, but I wasn't aware of the properties associated with them. Apparently garnets are believed to promote vitality, courage, passion, and love. Who knew? These beautiful earrings are exquisitely made and are so delicate and lightweight when worn. I adore them! Uncommon Goods has so much lovely jewelry for anniversaries or unique gifts for friends and family too, so check out some of their wonderful items here. I thoroughly enjoyed getting a chance to review these three products. They are all well-made and will be enjoyed for a long while to come. I absolutely love the eclectic range of products that they offer. It's a wonderful site to visit if you want to get something just that extra bit special for someone in your life. *Disclosure: I was sent these products free of charge for review. All opinions are my own.